How Do They Cook Spinach in Rome? Janet and I (and our whole family) are keeping healthy with losing weight, exercise and eating good food. 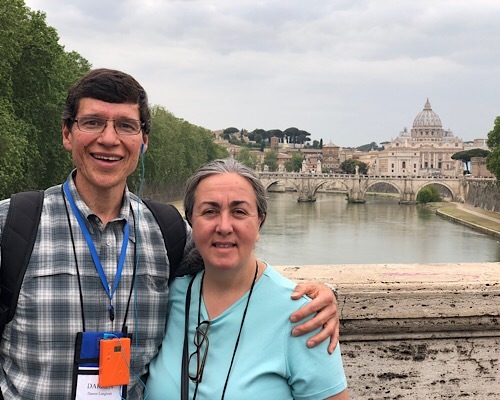 While in Rome last week Janet and I ate spinach every day. (Spinach is a SuperFood.) The spinach we ate was so good that we asked our friend Mario to show us how to cook spinach Roman-style. Not only did he include spinach (as a SuperFood), but also two others: Olive Oil and Garlic. Like many times in the past our friend Mario took us downstairs into his kitchen on Via di Porta Cavalleggeri across the street from St. Peter’s Basilica — and we took a video so YOU could learn how to make this healthy and delicious dish. We also added some video and pictures from an exceptional restaurant where Frs. Alfonso Aguilara and Ben Cieply took us for our celebration at the end of teaching our course on apologetics. Here is the video! Bon Appetit! Papal Audience began our day — everyone go t good pictures and videos up close with Pope Francis. We left on a three hour walking tour through Rome which included the Trevi Fountain, lots of gelato, the Pantheon, Piazza Navona and more. We drove to St. Stefano’s Church for Mass where I gave an abbreviated version of my talk “Swimming Upstream“. 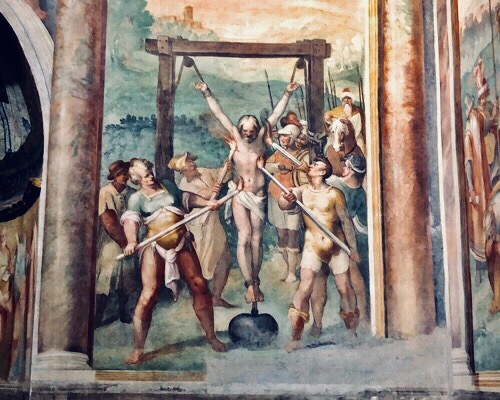 I showed them all the murals of the martyrdoms which are pretty graphic. Fr. Fran’sexcellent homily here. Liz Lev then came to our hotel and gave her one and a half hour slideshow presentation on the Sistine Chapel to prepare our group for their visit tomorrow. There is nothing else like Liz’s presentation and you can get a feel of it when she did it as one of the TED Talks. We had a great dinner here at the Michelangelo Hotel and a good nights sleep in preparation for a busy day, our last day, tomorrow.